The DDA40X is a 6,600 horsepower (4.92 megawatts) D-D experimental roadswitcher diesel-electric built by the General Motors EMD division of La Grange, Illinois for the Union Pacific Railroad. Nicknamed "Centennials" because they were built around the 100th anniversary of the completion of the First Transcontinental Railroad, and "Big Jack", the DDA40X uses two diesel engine prime movers, each rated at 3,300 horsepower (2.46 megawatts). With a total horsepower total of 6,600 hp (4.92 MW), the DDA40X is the most powerful single-unit diesel-electric locomotive ever built, surpassing the ALCO Century 855 built in 1964, which was rated at 5,500 hp (4.10 MW). However, more recent designs, such as the EMD SD90MAC and GE AC6000CW, have come close; both of these locomotives were rated at 6,000 hp (4.47 MW). It is also the third most powerful internal-combustion locomotive ever built (exceeded by the Russian Railways GT1, Union Pacific GTEL gas turbine units, and certain steam locomotives) and the longest single-unit diesel locomotive to ever be built. In 1969 Union Pacific was retiring the last of their gas turbine-electric locomotives. 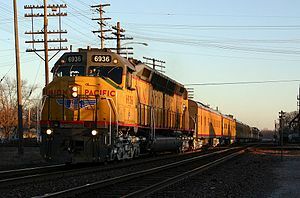 Union Pacific had ordered EMD DD35s and DD35As to replace the turbines, and the DDA40X was a further development. Forty seven were built between June 1969 and September 1971, except #6900, delivered in April in time to participate in the celebrations of the centennial anniversary of the completion of the First Transcontinental Railroad driving the "Gold Spike Limited" and arriving in Salt Lake City, Utah, on the morning of May 10, 1969. The units were numbered from 6900 to 6946, with 6936 still in service. The DDA40X is 98 ft (30 m) long. The frames were fabricated by an outside contractor, the John Mohr Company of Chicago, since the frame length exceeded the abilities of EMD's plant. Using more than one prime mover in a single locomotive was not new; the E-series were popular dual-engine locomotives, and Baldwin had produced (but not sold) a locomotive with four diesel engines. The 'X' in the designation stood for eXperimental, as the DDA40X locomotives were used as the testbeds for technology that would go into future EMD products. The modular electronic control systems later used on EMD's Dash-2 line of locomotives were first used on the DDA40X and the 4200 HP SD45X. The locomotives were the first to be able to load-test themselves using dynamic braking resistors as an electrical load so that external equipment was not required. The DDA40X used the wide-nosed cab from the FP45 cowl units. This design was superficially similar to the Canadian comfort cab introduced by Canadian National soon afterwards in 1973, but it lacked the structural reinforcements introduced in the CN design that were carried over to future wide-nosed cabs. As the DDA40X program was a test, a number of experiments were conducted during the service life of these locomotives. One such test included fitting a few of the units with air raid sirens to warn track-side personnel when away from grade crossings, but the results were inconclusive. Another of the tests included modular electrical components, which was successful. This made for easier diagnosis of electrical problems. These modifications were used in all future locomotive built by EMD. All DDA40X units included a new load test circuit, allowing units to load test without a track-side load test box. Gearing was 59:18, allowing 80 mph on freight trains. By 1974, averaging 22,000 miles a month, most DDA40X units had run over 1,000,000 miles and needed more maintenance. In the early 1980s, this factor, along with other issues including the higher efficiency of newer locomotives such as the SD40-2 and the national recession led to all 47 remaining units going into storage. In early 1984, as rail traffic rebounded, Union Pacific brought 25 DDA40X units out of storage and rebuilt them to return to service; 17 unserviceable units were retired in June that year. All DDA40X units were retired by May 1985. Several DDA40X units were preserved by various museums. The sole surviving operational unit, UP 6936, is still in service with UP, though mostly in excursion service. It is classified by the Union Pacific as a DD40X rather than a DDA40X as evidenced by the model designation on the cab of the locomotive. Thirteen examples survive, including one unit (6936) which is still in service with Union Pacific. UP DDA40X #6922 at Cody Park; North Platte, Nebraska. 6925 - Stored at Dakota Southern Railway’s rail yard located in Chamberlain, South Dakota. It is used for parts and fuel storage. 6930 - Illinois Railway Museum, Union, Illinois. Used as a control cab only, engines and motors are currently non-operational. 6944 - Museum of Transportation, St. Louis, Missouri, sent to Altoona in July 2014 for cosmetic restoration, which was completed in May 2015 and is now back on display at Museum of Transportation, St. Louis, Missouri in June 2015. 6946 - Western Pacific Railroad Museum, Portola, California. The last DDA40X built. This locomotive is fairly complete and on static display. ^ "The DDA40X, "Centennial"". American Railroads. American Railroads. Retrieved March 28, 2018. ^ a b Don Strack. "Utah Rails DDA40X page". Utahrails.net. Retrieved 28 January 2015. ^ "Union Pacific Railroad Roster of Diesel and Turbine Locomotives, 1934-2009". Utahrails.net. Retrieved 2 September 2015. Union Pacific Railroad Locomotive Department (1979). Locomotive Diagram Book. Union Pacific Railroad Company. Union Pacific Railroad Locomotive Department (1994). Locomotive Diagram Book. Union Pacific Railroad Company. Wikimedia Commons has media related to EMD DDA40X locomotives.